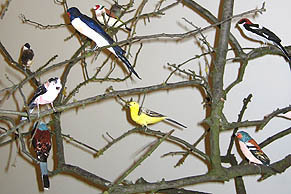 Annabel Dover’s Oriole brings to life the Collins Guide with sculpted plaster polychromed birds installed directly into wooded environments in the gallery. These birds would rarely if ever be seen together in the wild, and yet here they are, mimicking the impossible illustrations that 'naturalise' the apprenticeship of birdspotting, itself an act of culturally acceptable collective longing. The miracle of birds and the touching perverseness of the making-strange of them through the work of culture is brought to bear with equal force materialising the intrusion of the mind of man, both troubled and amazed, into the very fabric of the environment. On Saturday 14 October between 1 and 6pm you are invited to come to the gallery to draw birds with Annabel and artist Alex Michon as part of The Big Draw 2006. All ages are welcome and pencils and paper will be provided. All events at Transition gallery are free.